Gold used to be regarded as an investment for losers—for the crazies forever expecting the financial apocalypse. To the great economist John Maynard Keynes, it was a “barbarous relic” of a primeval economic past. Many people have abandoned that lousy stereotype now that the debt-driven bubbles in stocks and real estate have burst. Following the collapse of the world’s largest bank, the Royal Bank of Scotland, and the largest insurer, the American Insurance Group, among many other notable institutions now owned and directed by Western governments, people have come to understand the need for time-proven financial insurance that can insulate their wealth from government and financial firms. And there’s only one viable and liquid investment that enables a person to pull his or her wealth out of the financial system: gold. Buying gold has been the best method for shorting the government. Betting against government—that is, on a sudden, sharp rise in inflation—has strong odds in the midst of surging government deficits. Hyperinflation is fortunately a rare event and it is unlikely to emerge at present but consider that all 30 documented cases of hyperinflation (a situation where prices rise by at least 50 percent per month) have been caused by deficits that got out of control. Hyperinflation invariably emerges in a deflationary environment of weak economic activity, such as the one that now threatens the United States, European nations, and Japan. It can erupt when the public grows wary of the money being printed in growing quantities by monetary authorities, which are forced to buy—to “monetize,” in the financial vernacular—a surging supply of government bonds that the markets no longer all want to buy. Every currency in history has eventually fallen against gold—most dramatically in times like these, times of surging liabilities and an increasing inability to meet them. Gold is the only credible currency whose quantity cannot be expanded at will to meet the spending needs of governments in distress. By its very nature it remains scarce and rises in value as the supply of paper money grows and I think it’s safe to say that following the most dramatic credit crisis since the Great Depression—one that is continuing to produce ripple effects, like events in Greece that are broadening into Europe itself—we are likely to see historic investment shifts that will provide great opportunities. One major beneficiary will be gold. I strongly believe that present financial conditions are about to transform the investment strategies of the world’s largest investment funds in a way that will cause gold to surge substantially higher. To understand why, consider present asset allocation at some of the world’s largest investment funds. Pension funds… have a significant effect on the world’s markets, since they collectively manage $24 trillion, but gold plays a negligible role in their asset allocations… Since commodities typically represent around 3 percent of a typical fund’s total assets, and the precious metal makes up less than 5 percent of commodity allocation, that makes gold only 0.15 percent of a fund’s total assets. Add in the value of gold-mining stocks and precious-metals exchange-traded funds (maybe another 0.15 percent of total assets, at most), and a typical pension fund holds less than a third of 1 percent in gold—that is to say, virtually nothing. This is remarkable considering the tremendous diversification benefits the metal can provide for an investment portfolio. Over the past decade, stocks were down 24 percent while gold rose 280 percent, a fact that would have benefited any fund with a significant gold investment. Gold was beating stocks even during the 2002–07 stock-market rally. Most financial professionals today have never considered gold seriously as a major investment. Since it performed so poorly during the equities and bonds boom of the 1980s and 1990s—when most financial leaders today were moving up the ladder—many nurse a lingering sense that gold will never make sense as an investment. Suddenly, [however,] the financial industry is being forced to think long and hard about gold. Surging public debt in many of the world’s largest economies may be about to push the global government-bond market into a period of significant turmoil. If some part of the world’s $30 trillion in sovereign debt could be dumped by the world’s pension funds, insurance companies, banks, and individual investors, then where will that money flow to? Stocks? Real estate? Since pension funds already have high exposure to stocks and other assets like real estate and private equity, it seems reasonable to expect that some fraction of that capital—perhaps as much as $500 billion or more—could eventually flow into a time-tested real asset: gold. The effect of suddenly moving a substantial amount of investment money into precious metals… would be like shoving an elephant into a mailbox. All the gold in the world—all the jewelry, coins, bars, molars, and church art—is worth an estimated $6.5 trillion but the vast majority of global gold is not freely traded. In fact, perhaps only 5 percent of all physical gold actually trades each year, which would make the investment gold market around $320 billion. The mining industry produced around 2,500 metric tons of gold in 2009, worth around $80 billion at the average price for the year. A little over half of every year’s gold production is used for jewelry and industry, so less than $40 billion was available to the global investment community… With these numbers, a large shift of funds into gold would cause it to rise sharply and fast. If it rose from the minuscule part it represents in the world’s largest portfolios today to just 1 or 2 percent of global assets under management, the price increase would be substantial. A rise to $10,000 an ounce is not out of the question. It wouldn’t be the first time gold has risen in such a way: The price of gold jumped 23-fold in the nine years ending in 1980 – and at that time there was no question about the solvency of the U.S. government nor about the health of the banking system. Many times throughout history, governments across the world have driven their countries to the brink of ruin in the name of “saving the economy” by printing money to cover climbing public expenditures. In times like these, decisions regarding what percentage of wealth to hold in stocks versus bonds should be considered alongside the questions “How much money do I want to have in the financial system itself?” and “Am I adequately protected from government errors that could harm my wealth?” Today’s situation is singularly dire, but it won’t last. 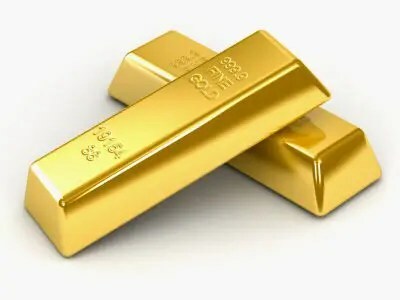 Gold will never outperform stocks and bonds over the long run, because it does not grow or produce a cash flow but in light of the challenges facing most other investment classes at present, investors should think carefully about gold. There are no reliable models to determine if it is “overvalued.” What if the world’s investors decided to transfer 3 to 5 percent of wealth out of cash and into hard money? Considering that only 0.6 percent of global financial assets is currently held in the metal, such a movement could push gold prices into the tens of thousands of dollars per ounce. If we reached that point, [however,] would it finally mean that gold had become insanely expensive—or simply that the world had less faith in the printed paper debentures of profligate governments? [In conclusion,] which currency is more trustworthy -[paper currencies or gold]? Which one is the real money? Previous Panic Before the Herd and Win-Win with Silver! Next Will This Be The USA in 2012?